Have you had your recommended dose of research? We have a well-loved mantra: research is a team sport. It’s not just about embedding a user researcher in the team to report back on what the user said, it’s about the team participating and collaborating with the researcher. Most often, this is done through people observing live research and truly engaging with the user. One simple aim can transform not only the way people work as a team but also the product they’re working on. Do you want to know the secret? Exposure hours. 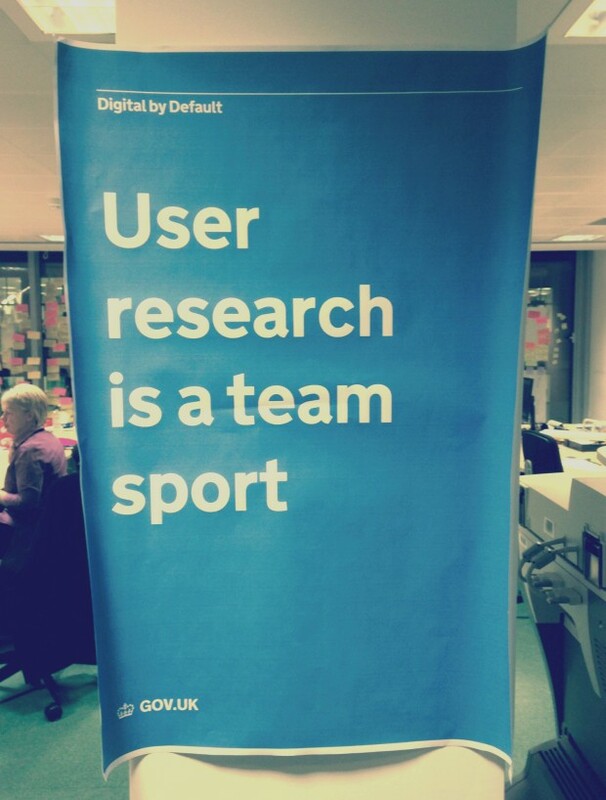 Everyone in the team should observe user research at least 2 hours every 6 weeks. There’s been a lot of good evidence by UIE research on the value of exposure hours. In my experience, it's true. It works! Not only do exposure hours validate the need to do research in every sprint, they also add value to what people are working on. There's nothing like writing content while watching users in action, really focuses the mind! It’s not always possible to get out in the field to watch people interact with a service or site. Lab usability testing often provides a great opportunity for people, en masse, to watch users in action. However, sometimes even lab sessions can be impractical. In a recent research session, we (securely) streamed the research to enable people outside of the lab to engage with the user. Although it’s not ideal and lacks the collaboration and conversation that may take place in the observation room, it’s better for the team to engage with the user somehow than not at all. It's powerful for teams to observe research. Having empathised with the user’s frustrations and joys in interacting with the service, the team can better relate to the people they're making for. This, combined with learning the language that users use, helps the team keep their users in mind and, ultimately, they design better services. You'll find that instead of people stating how they would use the service, or guessing how users may use it, they start referring to “How Tim from the session last week…” might use it, or “People like Gemma might use it in this way, like we saw when she used...” and so on. With most people’s diaries as busy as they are, exposure hours can seem tricky to fit in. 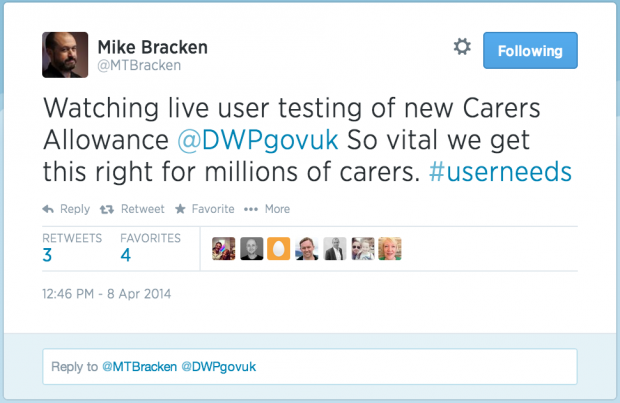 Even Mike Bracken, the Executive Director of Digital for Government, gets his exposure hours. If Mike can make time in his diary, I'm sure most us can. To make sure exposure hours are something they stick to, some people include it as part of their performance management, so they can make time for it and measure it. Maybe this will encourage more people to make time in their diary? So, here’s my challenge to you: make sure you and your team get your recommended dose of user research observation and see the difference it makes. I would love to hear the impact it has on your team and the products or designs they're working on. Leave a comment or tweet me. Keep in touch. Sign up to email updates from this blog. Follow Dipa on Twitter. I've seen that some teams refer to this as their TESLA score (Time Elapsed Since LAbs), with each team member having theirs tracked on a leaderboard. Thanks @RickyM - That is interesting! I guess anything that encourages people to observe more research can't be a bad thing. Hopefully once they get there, they see how interesting and useful it can be and want to go along more anyway. @Simon - I don't think this has been 'enforced' as such. Guess we take it for granted that many people here at GDS voluntarily come along. Although, I have once shown a few people a short video clip of a session (which included eye-tracking) to demonstrate the value of what you can learn when observing sessions. This did encourage a few of them to attend the next round of sessions, so maybe give that a go? We are just starting with "User`s Fridays". A loop of recorded user testing videos is playing all Friday. Anyone from company can come by and watch as long as he/she wants. @kalinay_v - Interesting idea. Do pop back and share with us all how it worked out, or any feedback people had on the idea. We're about to start Exposure Hours with our UX team, as well as Product Owners, Tech Team Leads and other teams. One question I still have is, when you analyse the findings together and come up with action points - how do you record all this data and actions? Rather than the static presentation style that no one reads - how do you track and record the analysis, and what happened next? We want this information available for future use, as well as other teams.